This paper is exploratory not definitive. Comments and input is greatly appreciated. My interest in the comparison between Rand and Locke started when I wrote my book The Decline and Fall of the American Entrepreneur. My investigation was spurred on by reading the excellent book The Power and the Glory: The Key Ideas and Crusading Lives of Eight Debaters of Reason vs. Faith, by Burgess Laughlin. In my opinion, John Locke is often misrepresented by both his supporters and detractors. I admit that I do not have the time or energy to review Locke’s original writings in depth at this time. Your input is appreciated. Charles Murray has suggested that Ayn Rand’s ideas are just a rehash of Locke, Nietzsche, and Adam Smith. I reject this out of hand. Nietzsche’s uberman influenced Rand’s fictional characters, but she rejected Nietzsche as her philosophical ideas matured. Adam Smith’s book Theory of Moral Sentiments is not consistent with Rand’s ideas at all. He wrote this book before he wrote The Wealth of Nations and the two do not appear to be entirely consistent with each other. As a result, it is hard to pin Smith down on his ethics and epistemology. The differences between Rand and Locke are more subtle. My book mainly discusses patent law in terms of Natural Law or Locke, because that is the historical basis for the founding of the US and US patent law. Readers of my blog State of Innovation may wonder what this has to do with patent law. My answer is everything, since this is about the fundamental basis of property rights. In my opinion all philosophers fall either into the camp of Aristotle or Plato. Aristotle’s metaphysics is that we can trust our senses and there is only one universe or as Rand stated it A is A. Plato’s metaphysics is that there is more than one world and our senses cannot be trusted to understand them or that our senses only give us a vague impression of the real world. Rand and Locke are both Aristotelian in the realm of metaphysics. His philosophy on human progress proposed the following: a) human beings can progress by acquiring knowledge, b) reason and action are subject to natural law, and c) the mind (as consciousness) is subject to scientific inquiry (Smith, 1997). A Deist believes in god or a deity that created the laws of the Universe and has no effect thereafter. John Locke’s epistemology was Reason. Reason is the means of integrating and conceptualizing perceptions by means of logic. It is distinguished from rationalism which starts with reveled truths and then applies a logical system derived from these assumptions. This is distinguished from empiricism which holds that man’s only source of knowledge is his senses without any recourse to concepts. The logical positivists did us one favor in showing that all logical systems are based on either an assumption, such as the Euclidean geometry’s idea that a straight line goes on forever and two parallel lines never intersect, or based on an observation. Some people argue that Locke was an empiricist. Locke was attempting to use the techniques of science to analyze ethics and political philosophy. (Note that he also defined the metaphysics and epistemology used by science.) People who argue that Locke was an empiricist usually argue that modern science is based on empiricism. This is incorrect based on the definition given above. Science builds on observation, but it is highly conceptual and many discoveries in modern physics derive from following the logical consequences of theory. For instance, the Higgs Boson particle was first predicted by following the math of field theory and now may have been verified by experiment. Locke was not an empiricist either, based on the definition given above. He is widely quoted as having said “logic was the anatomy of thought”, which would be inconsistent with empiricism. It is my understanding that Rand is explaining in modern language the concepts of Aristotle or refining them. This seems consistent with John Locke’s epistemology. This is where we see the major differences between Rand and Locke. In my brief survey of Locke’s ethics, I found two competing concepts for Locke. One is his ideas about Natural Rights and the other is a hedonistic perspective on ethics. Locke’s hedonistic perspective on ethics is in conflict with Rand’s selfishness and I would suggest in conflict with Natural Rights. Locke’s hedonistic ethical views start with the idea that people naturally want to maximize their pleasure and minimize their pain. Locke’s Natural Rights starts with the idea that moral laws are divine, but he does state these divine laws are discoverable by reason. This second part makes it consistent with his deist metaphysics. He does not seem to reconcile these two competing ethical systems. I will focus on Locke’s Natural Rights ethics. Locke’s formulation of Natural Rights starts with his concept of man’s rights in a state of nature. In a state of nature a man owns himself. Since he owns himself he has a right to defend himself. Man also has a right to those things he creates, which is where the right to property comes from. From these concepts the moral repugnancy of slavery follows as well as most of traditional criminal law, contracts, and property law. Locke does not explicitly state that man is an end in himself like Rand, however ownership in one’s self certainly implies this. To the extent we focus on Locke’s Natural Rights, Rand and Locke are not in conflict and I would suggest Rand’s ideas are a refinement and provide a deeper insight. Like Relativity and Quantum Mechanics expand our knowledge over Newtonian physics, but are not in conflict with it. There is only one fundamental alternative in the universe: existence or nonexistence—and it pertains to a single class of entities: to living organisms. The existence of inanimate matter is unconditional, the existence of life is not: it depends on a specific course of action. . . . It is only the concept of ‘Life’ that makes the concept of ‘Value’ possible. It is only to a living entity that things can be good or evil. From this she focuses on man and his unique tool of survival, which is his mind. It is reason that requires an ethics of individuality, where each person’s life has value separate from the species. This is not true of other organisms. Thus Rand ends up with an ethics in which each individual person is their own end. The exercise of their mind is the means by which they attain values to live. In order to achieve their values they must not only think but act. In order for this to be true, man must own himself, which is the starting point of Locke. The main difference between Locke and Rand is that Rand starts with a scientific or metaphysical basis of the nature of man to derive her ethics. Locke starts with the assumption that each man owns themselves, but Rand proves why this must be true. Her starting point is that every living organism must value its life or go extinct. Note there are ethical systems that do not value human life, so this cannot be taken as a given. We will explore these more later. The second biggest difference between Rand and Locke is she shows the central place of reason and the mind in man’s existence. Evolution had not been discovered at the time of Locke, so he could not use it to develop his ethics. Another major achievement of Rand was to debunk the supposed is-ought dichotomy. This issue was supposedly first raised by David Hume who lived after John Locke died. As a result, this was not a problem which Locke could address. In fairness to Hume, Rand starts with one assumption or observation in order to solve this problem, mainly that a living entity has to value its own life. As I pointed out earlier it is impossible to have a logical system that is not based on at least one assumption or observation. I have suggested that a deeper understanding of these issues can be had by understanding that evolution is the application of the second law of thermodynamics (entropy) to living organisms. Note I am not the first person to suggest that evolution and entropy are related. Applying entropy concepts to living organisms is fraught with potential logical errors. I have attempted to avoid them in my writings, but in passing these around I have found that even my most ardent supporters found them a little difficult to get through. My most well received post along this line is Sustainability isn’t Sustainable. My other posts on point can be found below. Life is a fight against entropy. Entropy as applied to economics is the concept of diminishing returns. It shows that inventions are the only way to overcome entropy – production without invention leads to the Malthusian Trap. As a result, this idea is consistent with Rand’s idea that the mind and reason are the primary means of survival but refines this to the understanding of the critical role of inventions. Why is this important? Because the intellectual battle today is against those people who have combined an incorrect interpretation of entropy with Kant’s emotion driven epistemology. These people do not believe human life is valuable, in fact they believe humans are evil because they believe we accelerate the entropy of the Universe. Other living species do not harness and use energy (outside their physical body) so they do not accelerate the entropy of the universe and therefore are not evil. These people advocate the death of at least five billion people as a moral good. The basis of their morality is founded on a flawed understanding of entropy and physics. For more information see The Pseudo Scientific Basis of Environmentalism. Defeating this evil philosophy intellectually is vital to anyone who values human happiness. Locke formulation of property rights is based on the Labor Theory of Property, which is commonly stated as when you mix your labor with natural resources you obtain property rights in your creation. This has been purposely mischaracterized and attacked by Locke’s opponents. Adam Mossoff has an excellent paper on point entitled Locke’s Labor Lost. Locke’s concept of property is that your productive effort crates a property right in the thing you created. One problem or misinterpretation of Locke’s theory of property rights is that labor means physical labor. This is most likely a mischaracterization, but leaves open the question of whether intellectual property such as patents is property. Rand’s theory of property rights is that they derive from your right to life. But Rand’s understanding that man’s mind is the most important tool for survival causes her to put intellectual property rights as primary. Ayn Rand’s more detailed understanding of man leads to the primacy of man’s mind and reason as his tool of survival. This leads to a deeper understanding of property rights and the primacy of intellectual property rights. My refinement of Rand’s ideas leads to the primacy of property rights for inventions. Locke and Rand are not in conflict philosophically, but Rand provides a coherent ethics based on the fundamental nature of man and living organisms, which Locke did not. Rand’s main difference in her epistemology is to dispense with the need for a deity, even one whose only effect was to create the world and her tackling of Kant’s emotion is a path to knowledge. I see the relationship between Rand and Locke as the difference between Newton and Einstein or Algebra and Analytic Geometry; refinement not opposition. I believe that Rand’s ethics can be further refined by understanding how entropy and evolution are related. This leads to a slightly different understanding of property rights, but more importantly provides a direct argument against the religion of environmentalism and the related “we are running out of natural resources” Malthusian economic argument. Ayn Rand’s Critics, Capitalism Magazine, by JAMES VALLIANT, http://capitalismmagazine.com/2011/08/ayn-rands-critics/, accessed 3/20/13. RESEARCH ON JOHN LOCKE’S INFLUENCE ON THE PHILOSOPHY OF DEISM DURING THE AGE OF ENLIGHTENMENT, Robert Waxman, http://www.robertwaxman.com/id85.html, 3/18/13. 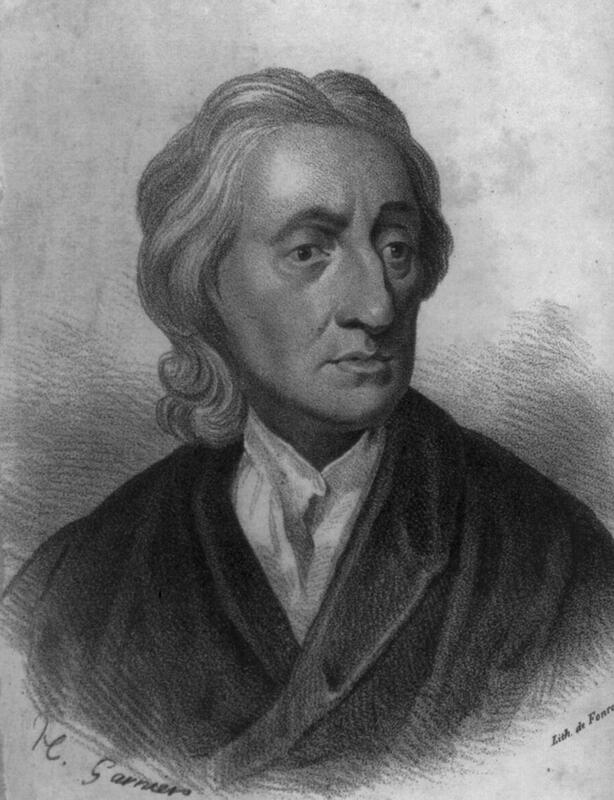 The Empiricist John Locke, http://nmalbert.hubpages.com/hub/The-Empiricist-John-Locke, 3/18/13. Locke’s Moral Philosophy, Stanford Encyclopedia of Philosophy, http://plato.stanford.edu/entries/locke-moral/, accessed 3/20/13. The state of nature concept has been much maligned by Marxists and others. They have purposely distorted his argument into an anthropological statement. This clearly was not Locke’s intent and shows an intellectual dishonesty on the part of Marxists. For those people who do not know, Relativity and Quantum Mechanics are in complete agreement with Newtonian physics except in the realms of very fast systems, very high gravitational fields, and very small distances. This is part of how we know they are correct. It is surprising that Rand was indifferent on the idea of evolution. Her ethics is clearly based on the same concepts. I believe the reason for this is she was worried it would lead to erroneous ideas about Determinism. This is a favorite argument of Christians. They believe it shows morality is impossible without god. This is inconsistent with both Locke and Rand. The Pseudo Scientific Basis of Environmentalism https://hallingblog.com/the-pseudo-scientific-basis-of-environmentalism/. Your idea that “entropy as applied to economics is the concept of diminishing returns [which] shows that inventions are the only way to overcome entropy – production without invention leads to the Malthusian Trap” leaves me wondering. Does not economic activity have both the possibility for accelerating *and* diminishing returns before new inventions are added to the mix, depending on the factors of production as well as the supply and demand variables? Do not inventions, and specifically those that increase efficiency, merely boost the acceleration of returns and/or reduce the diminishing of returns? If the latter is correct, then how can production without invention invariably lead to the Malthusian Trap? If you do not have any new inventions, and every bit of technology is maximized, then you are at maximum production. Overtime however you will begin to have to search farther a field or less profitable areas for the resources you need. For instance, you will not be able to just dig a 20 feet hole to find oil, or just use open pit mines for coal. Thus you will begin to run out of these resources and/or they become more expensive (requiring more energy – resources to obtain) as a result you fall back into the Malthusian Trap. A similar sort of thing has happened in the Orient, where better sanitation technology allowed more people to live in a given area. Unfortunately, the technology did not continue to grow and the extra people made inventions like the plow pulled by a horse or ox no longer useful. These technologies were lost and the people were actually worse off for the technology. Thank you for your reply, Dale. You have added “and every bit of technology is maximized” thus moving the goalposts of your original claim. And what about human labor being maximized? What you write in your last comment makes sense, and I agree that if you do not have any new inventions, and every bit of technology *and* every bit of human labor is maximized, only then, all else being equal, will you be at maximum production and entropy must ensue thereafter without there being new inventions. My point being that your original claim that “inventions are the only way to overcome entropy” assumes all three of the fore-mentioned premises, only one of which you had stated. I disagree. Without new inventions you have a limit and that limit is very close to where you are today. For instance, the cotton gin resulted in a 100x increase in the production of cotton in the US. Without the cotton gin maximizing existing labor and technology would never get you close to this return. Again, you are moving the goalposts of your original claim. I accept that we are very close to the limit today. Your article is not referencing today, it is referencing a principle. I am agreeing with your comments, just not with your entropy *principle* as stated in your article. It misses the assumptions I have highlighted. If you agree that it does, and that what has been noted in this comments section between us rectifies it, then we are in agreement. My aim is to agree, not disagree.